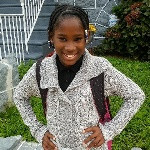 Justice is a beautiful young lady who loves to read and write in her spare time. Despite some hardships that she had to overcome, she shows amazing potential and zeal. She enjoys keeping a journal and has used this method as a way of coping with difficult situations and to communicate her feelings. She also enjoys traveling and would love a family who she could travel with. Justice feels that the ideal family for her would include a mother and father and possibly some siblings, however she is open to the possibility of a single parent. She continues to show great courage as she waits to be placed in a home where she'll receive plenty of love and attention. She also waits for a family who will communicate openly with her. Justice would like to keep in contact with her other siblings. Justice desires to be adopted and to feel wanted and loved by a family. Justice is legally free for adoption.